The 21" Eclipse Ride looks great, and for once the vividly contrasting dual surface is echoed in clearly different tonal responses, offering plenty of versatility for the enterprising player. The new, one-off 21" Eclipse Ride is nominally part of Dream’s Dark Matter series (first seen in 2010), which itself has four sub-categories - Flat Earth, Moon Rides, Energy and now Eclipse. The hybrid nature of the Eclipse means that it embodies a shiny outer lathed band characteristic of the Energy cymbals, while the inner, unlathed area is characteristic of the Moon Rides. The Dark Matter process involves sending an ostensibly finished cymbal back through the oven one more time. This is followed by repeated hammering then a cold water dousing. 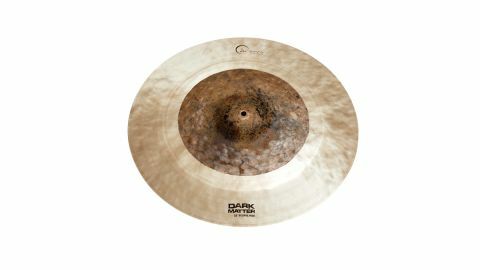 As a result, the outside of the cymbal is left fused with a coat of ash and soot from the oven, hence the blackened mottled appearance of the central 12" of the Eclipse cymbal (above and below). The outer area of the disc though is fine-lathed to a golden sheen, Energy-style. As a two-zone cymbal the demarcation is visually striking. But we’ve seen previously with hybrid cymbals that sometimes the whole becomes less than the sum of the parts by diluting the strength of each component. The result is you’re left with an indecisive instrument. The good news in the case of the 21" Eclipse is that the visual delineation really does mark out two contrasting responses, both of which have their own strengths. The outer, lathed area has a pronounced Oriental trashiness, but retains a good stick clarity. So there is a mellifluous spread, but there is also an ever-present sparkle. While the sound is full-bodied it is also quite dry and dark, while the sustain is not over long. This is a positive for crash-riding, as the wash does not build up uncontrollably. As an outright crash the Eclipse delivers a full and warm whoosh, with the sustain again reined in by the dual surface composition, so that although big it is not overwhelming. The lathed edge also responds well to lighter crashing and gentler coaxing. Moving towards the inner circle, the sound gets harder, more brittle and ping-ier. It runs smoothly into the big round bell, which is a continuum of the Moon aspect with more of an anvil-like ding. This whole central section is tougher and clangier. Yet you can still discern the silvery warm smoothness of the outer section in the background, sizzling away underneath the dry and metallic top sound. The contrast being so vivid, it does throw up the question of function and compatibility. We feel the inner area responds better to a heavy stick with a large acorn, while the outer plays better with the opposite. Put simply, the inner suggests a rockier/metal band while the outer suggests a jazzier/folkier band.